For most readers of the French newspaper Le Monde, Plantu is an institution. His cartoons hit the front page of the paper almost daily and they usually set the tone for the news of the day. In that respect, he is also an exception. In the French news media, images have become overwhelming and cartoons are often, if not always, relegated to the editorial pages. A man of simple allure, with an almost childish expression, Plantu's true language is that of images. If he cannot find his words, his pens usually come to the rescue. As a child, he did not articulate a world before the age of 5 and was very quiet. He initially embraced the idea of becoming a doctor but soon gave up to study drawing at Ecole Saint Luc, a well-known art school in Brussels popularized by Hergé. He now says, with some irony, that his job consists now of "caring" for the politicians. Most of the time, you would hear him saying that he is "furious against politicians," and against the ongoing apathy of society. Revolt and indignation are his motivating forces. "We are saturated with images that make us asleep, even if they are beautiful images done by talented photographers, said Plantu during the interview. "My work is not to put people to sleep. My work is rather to scream and tell people that there are problems that we need to address." Cartooning, according to Plantu, is a mix of signs that allow you to convey a message in an incredibly powerful way. To his detractors, who think some of his drawings have been too satirical, Plantu recognizes the need to use subtlety in dealing with delicate issues, such as religion. But he remains adamant about the necessity to confront ideas and to fight the existing marketing trend of the news media world. "More and more, I say to myself that I am a journalist who draws whereas before I would introduce myself as press cartoonist," he said. "And since more and more in the French media — and this is true for Europe too — the press tends to simplify things and to be more caricaturist, I have found myself doing more of a journalist's work, almost to the point of bringing out the subtleties in the information, whereas my job is really to fuss around it." Although most of his drawings deal with the inner circle of French politics, Plantu acknowledges a profound interest for third world issues and the peace process in the Middle East. He drew his first drawing for Le Monde in October 1972: it represented a dove, symbolizing the peace in Vietnam. In 1991, he met then-Palestinian leader Yasser Arafat, who drew the Star of David on the Israeli flag. A year later, Israeli politician Shimon Peres and Arafat autographed one of his drafts before they decided to ratify the Oslo Accords. Plantu was inspired by the powerful outcome of the meetings and he decided to initiate a series of meetings for international news cartoonists, with the idea of "opening the debate" and reflecting on the responsibilities of their work. Kofi Annan, then the United Nations general-secretary, with whom Plantu met in 2002, offered to sponsor the events. "Too often cartoonists stick stubbornly into a strict militancy, and this aspect does not interest me," said Plantu. 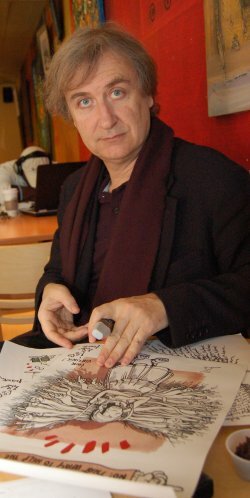 "What interests me tremendously is to mingle cartoonists from all over the boards: a Jew, a Palestinian, an Iranian, or an Egyptian"
Cartoonists from all over the world — Canada, Denmark, Egypt, France, Belgium, Germany, Iran, Israel, Japan, Kenya, Mexico, Palestine, Switzerland and the United States — attended the October 2006 "Cartoonists for Peace" conference at the Emory University's Claus M. Halle Institute for Global Learning in Atlanta, GA.
"It is very courageous for some of these cartoonists to come and meet here, in the United States," said Plantu. "They are subject to an immense political threat back in their countries, and some of them are petrified with fear." His objective, he says, is to have them come back. Plantu has been around the world with his cartoons, but surprisingly he has visited the United States only a couple of times. In early 2006, Claude Wegscheider, director of the Alliance Francaise in Atlanta, invited him to the U.S. It was an occasion to measure him up with the American Pulitzer price cartoonist Mike Lukovich in a "duel" of cartoons. The American public, Plantu says, is receptive to his cartoons and respectful. Still, he confessed, bemused, that for some cartoons, particularly ones dealing with explicit sexual content, an American newspaper could not be found to publish them. But he appreciates the fact that "everything is possible here." "I will not say that I perceive the U.S. as a model, but what interests me is to look for incredible things that people in this country are capable of generating, and that makes me even more outraged," he said. "And that feeling I love, because when I am outraged, ideas of cartoons are pouring in my head." Plantu's Web site can be viewed at www.plantu.net. View the Worldpress Desk’s profile for Virginie Drujon-Kippelen.